Wenger used important features of the Alinghi yachtsman's knife in this large folder designed for the modern woodsman. Advanced ergonomic body details include rubberized inserts for better grip and comfort. It's a great design if you expect to use a knife for hours instead of minutes. The non-slip grip of the Rangergrip 178 stays in the hand by shape as well as by texture. That becomes more important on cold days when fingers numb and handle materials harden. The large thumb loop built into the 3.9-inch-long main blade allows one-handed operation with simple thumb pressure. Oil the pivots lightly on occasion to keep the action smooth. The knife blade locks into open position and may be safely used for piercing work as well as for carving and slicing. Half the edge is plain for fine cutting, and the other half is a smoothly cutting serrated edge designed for quick parting of cords and straps. The toolkit may be limited compared to bulkier multi-tools, but the several good stainless steel blades offered by the Ranger are well designed and very practical. Teeth on the high carbon stainless steel saw blade -- 4.2 inches long -- set slightly to either side of the blade and cut a kerf wider than the steel. Unlike some blades with saw teeth but no set, this one won't bind. The flat screwdriver blade also locks in place, and the knife carries the important standard options of bottle and can opener, Phillips screwdriver, awl, and reamer. With fewer blades, the knife shows better balance and less weight. At 5.1 inches long, the Rangergrip only weighs 5.6 ounces. This large knife carries better on the belt than in the pocket. A nylon belt pouch is available separately. 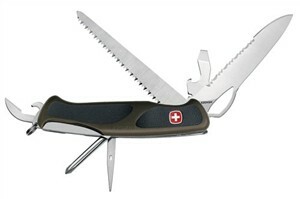 See the Victorinox Forester for Victorinox's version of the Swiss Army outdoorsman's multi-tool.